If it weren’t for the insistence of Ramiro Peña’s wife that he go back to school, he would not have earned a bachelor’s degree, and he probably would not be working toward his Master of Fine Arts at The University of Texas Rio Grande Valley. “At the time, she was making more money than I was and told me it was time for me to go off and get my degree. She told me, ‘I will support you,’” Peña said. Peña is the epitome of a non-traditional student – married, with children, 45 years old, and with a two-decade career behind him. His wife, Alma, a first-grade teacher in Weslaco, told him it was her turn to help him achieve his dream of earning a degree and pursue his love of art. So he quit his 19-year job at Magic Valley Electric Cooperative and became a college student again, studying 2D art and taking every opportunity offered to enhance his craft – from studying abroad in Italy to working with art professors to perfect his style, which he refers to as “realism.” “With my wife’s encouragement, I decided to take that leap of faith and come back to school,” Peña said. “It was a difficult decision, because I had my doubts.” Still, Peña, who lives in Donna, gave it his best and earned his Bachelor of Fine Arts in 2013 from The University of Texas-Pan American, a UTRGV legacy institution. Before graduating with honors, Peña produced an undergraduate art exhibit titled “The Silent Departed Heroes,” which pays tribute to more than a dozen service members who enlisted in the U.S. military to gain U.S. citizenship and were killed in combat in the process. He says the series of portraits allowed him a deeper appreciation for the men and women who serve and protect the United States. “The idea was to keep the humanistic quality behind it. So I had to be very sensitive to that and not lose that in my interpretation of them and their service to our country,” he said. As a graduate student, Peña now continues his salute to veterans through a commission by Edinburg H-E-B at 2700 W. Freddy González Drive, to develop one of the biggest art projects he has ever undertaken – two 8-foot by 12-1/2 foot murals honoring Edinburg hometown war hero Alfredo “Freddy” Gonzalez. A U.S. Marine Corps platoon sergeant, González was killed on February 4, 1968, at the Battle of Hue in Vietnam. He was posthumously bestowed the Medal of Honor, and in 1996, a Navy guided missile destroyer, the USS Gonzalez, was commissioned. The murals will be displayed at the store, and the large-scale artwork will be completed by May 2016. On Veterans Day, November 11, 2015, the store unveiled two small-scale versions of Peña’s mural artwork during a celebration honoring veterans. Dolia González, Freddy’s mother and an H-E-B employee, will be given the smaller versions of the paintings once the larger murals are completed. If it weren’t for the insistence of Ramiro Peña’s wife that he go back to school, he would not have earned a bachelor’s degree, and he probably would not be working toward his Master of Fine Arts at The University of Texas Rio Grande Valley. “At the time, she was making more money than I was and told me it was time for me to go off and get my degree. She told me, ‘I will support you,’” Peña said. Peña is the epitome of a non-traditional student – married, with children, 45 years old, and with a two-decade career behind him. Still, Peña, who lives in Donna, gave it his best and earned his Bachelor of Fine Arts in 2013 from The University of Texas-Pan American, a UTRGV legacy institution. Before graduating with honors, Peña produced an undergraduate art exhibit titled “The Silent Departed Heroes,” which pays tribute to more than a dozen service members who enlisted in the U.S. military to gain U.S. citizenship and were killed in combat in the process. He says the series of portraits allowed him a deeper appreciation for the men and women who serve and protect the United States. “The idea was to keep the humanistic quality behind it. So I had to be very sensitive to that and not lose that in my interpretation of them and their service to our country,” he said. As a graduate student, Peña now continues his salute to veterans through a commission by Edinburg H-E-B at 2700 W. Freddy González Drive, to develop one of the biggest art projects he has ever undertaken – two 8-foot by 12-1/2 foot murals honoring Edinburg hometown war hero Alfredo “Freddy” Gonzalez. A U.S. Marine Corps platoon sergeant, González was killed on February 4, 1968, at the Battle of Hue in Vietnam. He was posthumously bestowed the Medal of Honor, and in 1996, a Navy guided missile destroyer, the USS Gonzalez, was commissioned. The murals will be displayed at the store, and the large-scale artwork will be completed by May 2016. 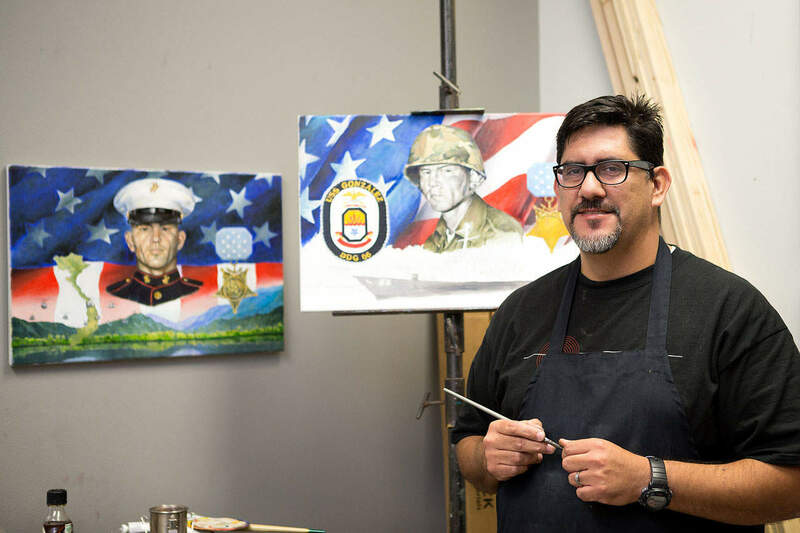 On Veterans Day, November 11, 2015, the store unveiled two small-scale versions of Peña’s mural artwork during a celebration honoring veterans. Dolia González, Freddy’s mother and an H-E-B employee, will be given the smaller versions of the paintings once the larger murals are completed. Peña said he will be spending his Christmas break working on the mural, with assistance from fellow graduate art students. “I hope my kids don’t mind,” he said. Honoring veterans is important to Peña because his late father, Rogelio Z. Peña, was a World War II veteran as well as other members of his large family, who have served in U.S. military operations over the years. “My dad being in the military was a big deal in my family,” he said. Peña was born in Salinas, California, one of 12 children. They were a migrant family, traveling and working the labor in California and Michigan. His father not only fought in WWII, but also fought for the equality of migrant workers as part of the Cesar Chavez labor movement, Peña said. Peña was the second in his family to graduate from high school, and the first to earn a college degree. He currently works as a craftsman at the International Museum of Art and Science in McAllen. He has had many heroes in his life – his father, his wife, and his son, Noah, a UTRGV sophomore studying biology/pre-med and working on research for antibiotics for AIDS and cancer patients. And none of his own accomplishments would have been possible, he said, if not for the sacrifices of his wife, who is working to put him through school, and of military veterans everywhere, like his father, who put their lives on the line every day so he can pursue his passion for art. Peña hopes that when the public sees the murals, they take the time to reflect on González’ sacrifice for his country and remember to be thankful every single day for what they have.